A little more than a month ago, something strange appeared over Dustin Pedroia’s locker in the Red Sox clubhouse. It was red. It was feathered. It was autographed. It was . . . one of Ric Flair’s old robes? Apparently, Pedroia and his locker neighbor, Josh Reddick, mined eBay for it, ponying up $400 to grab it in an auction. Next came a WWE championship belt. Then, a Hulk Hogan varsity jacket. The locker room was becoming a closet for pro wrestling collectables. Yesterday, though, the players got a surprise. 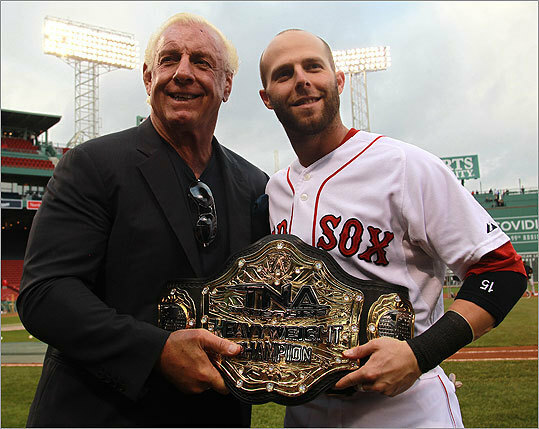 The Nature Boy himself walked through the door, strolled past the media, and sneaked up on Pedroia. He brought an authentic TNA championship belt (with protective cover), they exchanged some of Flair’s signature, “Woo!s,’’ and posed for a picture. Media relations director Pam Ganley arranged the drop-in. Pedroia was a step from starstruck, rattling off the number of titles Flair’s won (16) and insisting that Flair, 62 and still suplexing, be put on the 40-man roster. “It’s Flair-mania,’’ Pedroia said, showing the belt to David Ortiz, who wasn’t in the locker room when things went down. Pedroia, who’s had a million nicknames (Muddy Chicken, Laser Show, and most recently HBO) adopted some of Flair’s showmanship. He had his Flair-isms down, offering the wrestling icon a chance to do some “jet-flying’’ and “limousine-riding’’ (Flair is also into “kiss-stealing’’ and “wheeling-and-dealing’’). For a team that’s had its struggles lately, it was a bit of relief. The lift didn’t last long. The Sox fell to the Orioles, 7-5, for their 11th defeat in 14 games. Still, their wild-card lead remained at two when the Tampa Bay Rays also lost. The pair joked they wouldn’t lose another game after Flair’s cameo. That didn’t pan out, but they didn’t come away emptyhanded. “Who would have thought this whole thing would have started out just buying a robe on eBay,’’ Reddick said. Between the robe and the belt, they spent about $500. ever root for the Yankees?